Fried Kway Teow, is also known as Char Kway Teow. It is a very famous hawker food that is known to all home-grown Singaporeans. 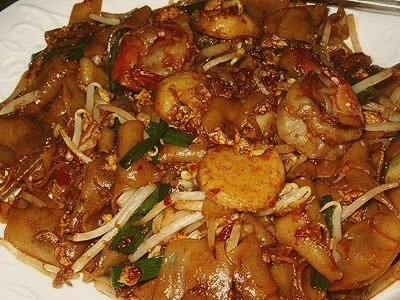 Char kway teow, literally "fried flat noodles", is a popular noodle dish in Malaysia and Singapore. The dish is made from flat rice noodles (?? he fen in Mandarin Chinese) of width approximately 1 cm or slightly narrower, stir fried over very high heat with light and dark soy sauce, chilli, prawns, cockles, egg, bean sprouts and Chinese chives. Originally, this dish include slices of Chinese sausage and fish cake. It is fried in pork fat, with crisp croutons of pork lard, giving it a characteristic taste. In this recipe, pork and lard is omitted specially for the Muslim friends out there. Wash the bean sprouts, peel and chop the onion into thin slices. Peel and carrots and chop into thin slices. Cut chili peppers into fine bits after removing the seeds. Peel and chop the garlic into fine bits. Cut the chicken sausages on the diagonal into 1/2 inch pieces steam them for about 10 minutes. Soak the shrimps in a lightly salted warm water for 5 minutes to remove smell. Mix oyster sauce, light and dark soy sauce and brown sugar together and set it aside. Heat oil in a wok at medium heat. Add in onions and carrots and stir-fry till onion soften. Add in chilli and garlic and stir-fry. Add in chicken sausages and sliced fish cake, fry a bit. Add in rice noodles and stir-fry continuously at high heat. Push up the sides and add in the sauces and once it boils, cover it over with the rice noodles. Add in bean sprouts and stir fry. Crack in the eggs now and make sure you stir rapidly so the eggs will not stick. Add in some water or chicken broth if the noodles get too dry. Add in salt and black pepper. Add in Chinese chives if desired. Serve hot, garnish char kway teow with cilantro if preferred. The key to goodness in char kway teow is extreme high heat. This allows the noodles to be cooked fast and yet delicious.